Some gems, like opal, are highly coveted but rare to find, much less in the sizes and quality people dream of owning. Synthetic, or laboratory created jewels, offer you the best of both worlds. You get the beauty of a beloved, rare gemstone, but at a budget friendly price. The term synthetic refers to a man-made material with a natural counterpart. The synthetic crystal replicates the chemical, optical and physical properties of the natural crystal with little or no variation. Newer untreated red to orange, gray-blue, white to colorless and gray to black stones have an SG between 2.22 to 2.27. Polymer impregnated stones have an SG between 1.88 to 1.91. 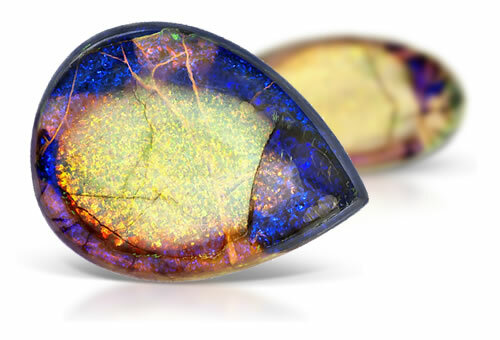 You can see the columnar structure of synthetic opal when viewed from the side. The stones play of color patterns often look like snake skin or chicken wire under magnification. Stones with vivid colors are probably polymer impregnated.